The Crook County Cowboys struggled to score runs in their first two baseball games of the year. 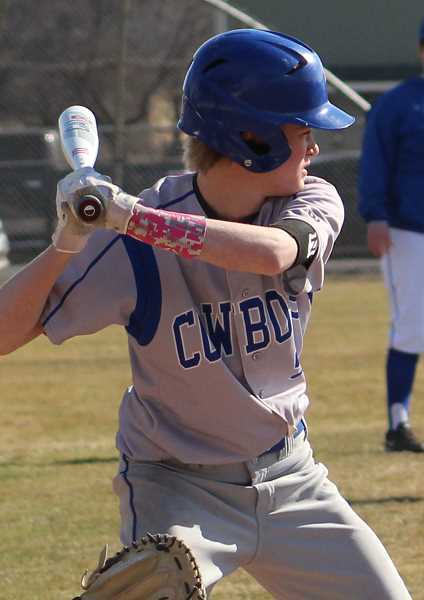 All that changed as the Cowboys went 2-1 at the Grant Union Invitational Tournament in John Day. "We scored quite a few runs, which was nice," Crook County head coach Kramer Croisant said of the tournament. "I think we got the bats going and played better baseball, so that was exciting." The Cowboys exploded for 29 runs in three games at Grant Union as they went 2-1 and finished second at the tournament. Crook County rolled past Homedale, Idaho, 7-2 in their opening game Thursday afternoon, then blasted South Umpqua 17-6 in the tournament semifinals. In the championship game against Dallas, the Cowboys led late in the contest before a late Dragon comeback gave Dallas a 6-5 victory. "We were up 5-2, and they came back on us in the sixth and seventh innings," Croisant said. "We were a little sloppy in that game, but I think we are definitely heading in the right direction, and we are starting to play a lot better baseball." On Thursday, Homedale jumped on top with two runs in the top of the second inning. However, that was the last two runs that Homedale would score. The Cowboys answered with a run in the third and another run in the fourth to tie the game at 2-2. Crook County then exploded for five runs in the bottom half of the fifth inning to take control of the game. Garett Bernard and Louis Duran combined to give up just two hits while striking out seven batters. Bernard pitched the first three innings of the game, not allowing a hit, but giving up the two runs. Duran came in to pitch in the fourth and pitched the rest of the way, scattering two hits while striking out four as he picked up the win. Duran also had three hits, including a double, and drove in a run. Hunter Bishop and Kyle Knudtson each had a pair of hits and an RBI, while Ethan Cossitt had one hit and two RBI's. As a team, the Cowboys had 10 hits in the contest, while Knudtson, Bishop and Brody Connell each stole a base, and Duran stole two. Friday, the Cowboys got off to a slow start against South Umpqua but quickly recovered. South Umpqua scored three runs in the top of the first inning. However, the Cowboys quickly responded with three runs of their own in the bottom half of the inning. South Umpqua added a fourth run in the top of the third inning, chasing starting pitcher Carson Smith. Crook County scored four more runs in the bottom of the fourth inning to take a 13-3 lead. South Umpqua added a pair of runs in the fifth to close to 10-6. However, the Cowboys put the game away for good with four more runs in the sixth inning as they ended the game on the 10-run rule. Brentt Jackson picked up the win for the Cowboys, while Clayton Wilkins closed out the game with an inning of no-hit ball. Although Smith failed to earn a decision, he had seven strikeouts in his four innings of work. The Cowboys finished with 11 hits in the game, including doubles by Bernard, Smith, Matthew Delapena and Knudtson. Bernard also had a triple in the contest, while Bishop stole four bases, Ethan Cossitt stole three and Jackson stole one. Knudtson and Cossitt each had two hits and three RBI's in the game, while Bishop and Bernard also had multi-hit games. Friday's win set up a showdown with the Dallas Dragons, who were undefeated heading into the game. Dallas opened the scoring with an unearned run in the bottom half of the first inning. Both teams scored runs in the third inning, giving the Dragons a 2-1 lead. However, the Cowboys took control in the fourth inning, scoring three runs to take a 4-2 lead. Crook County added a fifth run in the top half of the sixth inning before Dallas scored two in the sixth and two in the seventh to take the one-run victory. Knudtson pitched the first five innings for Crook County, striking out 10 and allowing just three hits, while giving up a pair of unearned runs. Connell closed out the game for the Cowboys, giving up four runs in just over an inning of work. Crook County finished with seven hits in the contest, compared to six for Dallas. However, the Cowboys committed five crucial errors in the game, compared to just two errors for the Dragons. Bishop had a double, a triple and an RBI to lead the Cowboys at the plate, while Bernard added a double and Carson Smith, Cossitt, Duran and Justin Smith each had a single in the contest. Cossitt also stole a pair of bases for the Cowboys. With the win, Dallas improved to 4-0 on the year, while the Cowboys dropped to 2-3. Crook County is back in action on Thursday when they travel to Madras for the three-day Madras Invitational. "I'm pleased with what I'm seeing so far," Croisant said. "Our expectation is high going into Madras. Our goal is to win the tournament, and I think that we have a really good shot at it."